Serious Batman Fans and Hockey Fans should be excited about this! On Saturday, November 22nd, in Toledo, Ohio at the Huntington Center they will be celebrating the 75th Anniversary of Batman with a special "Heroes Night"! 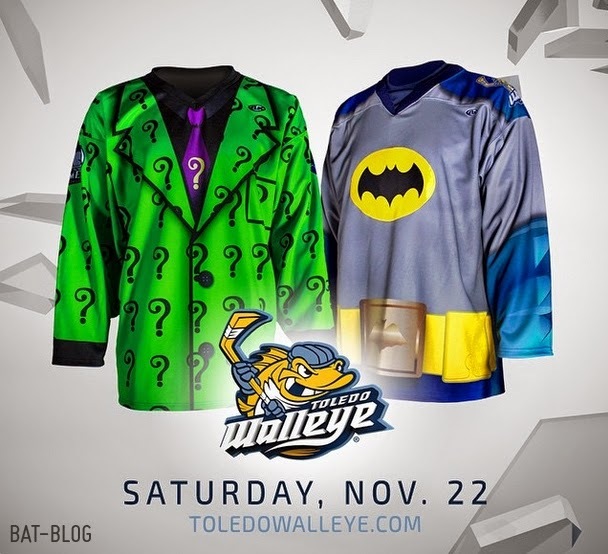 The Toledo Walleyes and Evansville IceMen will do battle on the ice wearing special "Batman-Themed" Hockey Jersey Uniforms that are modeled after the costumes of Batman and the Riddler! Proceeds from the event will benefit the Muscular Dystrophy Association, March of Dimes and the Walleye Wishing Well. A limited number of replica Batman themed jerseys will be available at The Swamp Shop on Monday, November 3rd, 2014. For tickets call (419) 725-9255 or click here to visit the official TOLEDO WALLEYE website.